Mom was born on December 21, 1918. 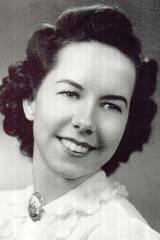 She died January 14, 2009, less than a month after her 90th birthday. I was privileged to know her, to have her as my mother and as my friend. I considered her “my rock”–the one person who, from as early as I can remember, loved me unconditionally. She made everyone feel that way. Mom was all about love: love of family, of bright colors and of the flowers in her garden. She supported her children and grandchildren in everything we did. We wanted her to be proud of us, and she always was. She loved us unconditionally, whatever the circumstances, whatever the challenge. Over the years we became aware of her favorite sayings for challenging times. She never said: “it will be okay”, or that “everything happens for a reason”. She did say things like “it came to pass, it didn’t come to stay, it came to pass”, and “life is what happens when you are making other plans”. When she didn’t know an answer to a question, she would “put it on the shelf” until she had an opportunity to figure it out. Even when mom and dad moved into an assisted living center, mom dedicated her life to beautifying the world around her. Having lost the garden at the home she shared with dad, she became the volunteer gardener at the Groves, planting elaborate pots of brightly colored flowers for all of the residents to enjoy. She visited friends and strangers alike who lived in the areas reserved for those who were incapable of caring for themselves. She provided them the limitless love that was at her core. When she died there was nothing left of her but her endless love.